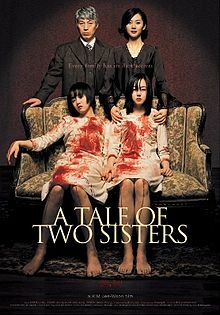 With the unexpected death of their mother - two sisters find themselves in a mental institution. Upon release they return home only to find a new step mother to deal with. As the pair struggle with the new mother's obsessive ways they also encounter a dark ghostly force that leads them to believe that maybe their mother’s death was at the hands of a psychotic killer. This is the final film in this week’s look into K-Horror. Horror fans may recognize this movie because this is the original film in which “The Uninvited” (2009) was based off of. As a fan “The Uninvited”, I was amazed on how much intense the original film is. Although the camera pans are slow and drawn out, this film captures the true psychological aspect that I felt “The Uninvited” missed out on. The acting in the movie was superb and the character development is phenomenal. Since foreign films allow the viewer to think as opposed to American films in which every single scene must be explained - the director was able to create a seamless flow throughout the entire movie. Out of the three Korean horror films that I reviewed this week, I am rating this classic as my number 2 K-Horror flick behind Arang. Unfortunately I am unable to go into great detail about the movie due to the fear of containing spoilers. I would definitely recommend this movie to any genre fan.